Open product size: 24 x 22 x 28 cm / 9.4" x 8.7" x 11"
Folding product size: 24 x 22 x 2 cm / 9.4" x 8.7" x 0.8"
Compact size --- unfolded: 9.4" x 8.7" x 9.4". folded: 9.4" x 8.7" x 0.7", this shooting tent can shoot small products, such as digital products, jewelry, watches, and so on. High-quality --- special custom materials,swith a matte surface, light reflection uniform, objects more three-dimensional, waterproof, moisture, wrinkle; keep clean and neat by wet cloth to wipe it directly. Resist compression. 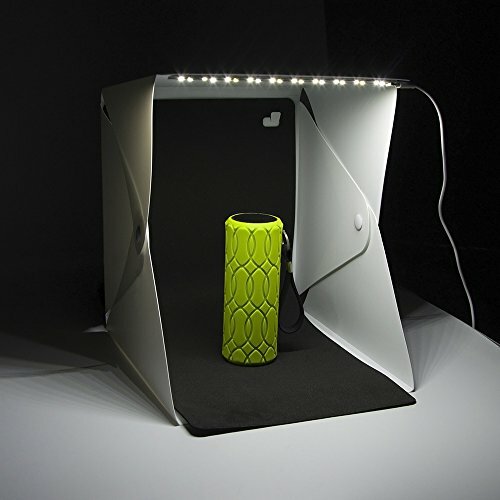 Easy to install --- your own photo studio anywhere in minutes, you can unfold this LED lightbox studio and place it on any surface to get a picture in the perfect background for the product. Portable design --- easy to store and carry, ideal for you to shoot high quality picture for small products. Ideal background --- two backgrounds (white and black) are available to meet your needs for shooting ideal photos. If you have any questions about this product by Smiful, contact us by completing and submitting the form below. If you are looking for a specif part number, please include it with your message.